There are currently 49 online users. How about the banking system? Many people, private institutions or government agencies believe that everything about cryptocurrencies is wrong. Since their rise to popularity and value appreciation, cryptocurrencies have been criticized, especially in the case of bitcoin, for causing harm to the environment as a result of mining activities that consume too much power. Cryptocurrencies have also been bashed for not having any value, with many people calling these virtual currencies the “biggest scam of all time”. A bigger issue used as a reference point for crypto-criticizers is the fact that digital currencies are breeding grounds for money laundering and other illicit financial activities. Cryptocurrencies are young, the industry is still grappling with many problems, and adoption is not yet strong. Crypto-aficionados agree, together with the its critics, that these money laundering problems are real. Right from SilkRoad to recent money-laundering reports through different cryptocurrencies, the industry is battling with law enforcement agencies across the world, as well as facing the criticisms of advocates of a money-laundering-free financial system. Data from CypherTrace shows that since 2009, more than $2.5 billion worth of Bitcoin has gone through the hands of illicit financial dealers. The money laundering activities that have gone through other cryptocurrencies are not even accounted for. But is cryptocurrency the biggest enabler of money laundering around the world? No. One major issue is that every money laundering claim in recent times seems to be directed towards cryptocurrencies. That’s a big mistake. Since the introduction of cryptocurrencies and their subsequent involvement in money laundering activities online, a lot of individuals, world-renowned leaders, and international institutions seem to have placed almost all the money laundering woes on these digital currencies. According to the statistics, the involvement of cryptocurrencies in illicit financial activities form a small, insignificant portion of global money laundering activities. Blaming cryptocurrencies too much for almost every money laundering problem leaves the major issues out of the picture. As Rob Wainwright, head of Europe’s police agency Europol estimated, only 3 to 4 percent of the continent’s annual criminal activities are linked to cryptocurrencies. So if crypto forms a small portion of the illicit financial world, which area leads the industry? Banks. Money laundering is no new problem. The United Nations Office on Drugs and Crime estimates that between $800 billion and $2 trillion, representing 2 to 5 percent of global GDP, is swept away through money laundering activities every year. It turns out a chunk of this money passes through supposedly highly regulated financial institutions and banks. These statistics show that nearing 100 percent of the money laundering activities end up passing through a bank. There is no bank in the world that does not have an anti-money laundering regulation. Add this to the country-wide and regional AML regulations, as well as increased spending on anti-money laundering policies, and banks could be well placed to fight illicit financial activities. But over the years, the opposite has been on the rise. Money laundering has become a global canker for the financial sector, a phenomenon ignites every single day. From the infamous Bank of Credit and Commerce International (BCCI) scandal in the 1980s that had dealings with the likes of Manuel Noriega and Saddam Hussein, and the $6 billion Liberty Reserve mess in 2013 to the recent 200 billion Euros launderedthrough Danske Bank; illicit financial activities are increasing in the financial services and banking industry. Amidst all the anti-money laundering regulations, issues like the Panama Papers released in 2016 showed us the level at which big financial institutions engage in money laundering. In 2018, the degree to which banks serve as safe havens for illicit financial activities became paramount, with many banks getting caught up in different forms of scandals. The end result is that these banks have been fined huge sums. JPMorgan Chase has had its share of the fines, where the bank was asked to pay $2.05b for allowing Wall Street financier Bernard Madoff to run a $65 billion Ponzi scheme through the bank. HSBC was equally fined $1.9b in 2012 for allowing more than $670 billion in wire transfer from Mexico to pass through the bank’s systems, as well as Commerzbank’s fine of $1.45b for undertaking ineffective compliance controls in dealing with Sudanese and Iranian entities. Other banks have had their executives jailed for money laundering practices, including banker at state-owned Petroleos de Venezuela SA (PDVSA) who was jailed for 10 years, the sentencing of Arthur Budovsky, Liberty Reserve’s founder to 20 years in prison, and many other cases. Some of the well-known banks that have served drug cartels, terrorist organizations and other illicit financial activities include Citigroup, Standard Chartered, Deutsche Bank, ING, Wachovia, and the Commonwealth Bank of Australia. The ultimate goal is not to tag cryptocurrencies as perfect financial systems where money laundering does not occur. But to think that the first forms of anti-money laundering regulations started many decades ago, yet we still have banks accounting for a chunk of illicit financial transactions gives a proper perspective of what the problem is all about – and we can conclude that banks are safe havens for money launderers than cryptocurrencies are. The Ethereum wallet provider, MyEtherWallet (MEW), and crypto finance platform, Bity, have unveiled a fully-regulated crypto-to-fiat withdrawal system which doesn’t require users to pass Know-Your-Customer (KYC) checks. The “Exit-to-Fiat gateway” will allow cryptocurrency holders to exchange their digital assets, including Bitcoin (BTC) and Ether, into euros (EUR) or Swiss francs (CHF). The current limit for KYC-less transfer is anywhere up to 5,000 CHF, roughly $5,000 at the present exchange rate. “This Exit-to-Fiat gateway is a gamechanger for cryptocurrency users around the world because it allows people to exchange crypto to fiat without needing to be KYC verified,” said Kosala Hemachandra, CEO and Founder of MEW, in a press release. This is all fully-regulated, the companies say. Bity has integrated with MEW’s version-5 (V5), allowing the wallet interface to offer the gateway without any KYC requirements. The company, with a wide network of crypto ATMs in various Swiss cities including Zurich, Basel and Zug, has an established presence in the country in compliance with the Swiss Anti Money Laundering Ordinance (AMLA). Alexis Roussel, the founder and CEO of Bity, highlighted that their technology could “verify proof of wallet-ownership” without requiring users to provide personal information so as to validate their identities. He also pointed out that it would open up a new avenue for users, providing access to fiat-crypto exchange services outside the established platforms. “Our technology…will finally open doors for users to access a cryptocurrency exchange service that is KYC-less, yet regulatory compliant,” he said. This comes as MEW announces the launch of its version 5 wallet. As well as improving UX/UI, making the wallet more accessible for beginners, it comes with a host of new features. As well as Bity, there’s also a new exchange interface powered by the exchange service, Changelly. MEW says this will provide a wide choice between exchange services, competing against one another. The idea is to allow users to effectively ‘shop-around’ for the best rates and offers, hopefully lowering transaction fees and making the exchange aspect of the sector more competitive. KYC checks have become a pre-requisite for most exchange services looking to get on the right side of regulators. Although many crypto users, especially early-stage ones, complain KYC means they have to submit personal information to private, for-profit companies, few can now operate without it. The popular exchange service, ShapeShift, which resisted calls from regulators and the market to add KYC for months, eventually had to give in in September. Trading volume subsequently collapsed as some of its users moved to less-strict platforms. Bity has a history in Switzerland and can prove transactions are legitimate; the money restriction prevents the service being used for mass-money laundering operations. Once thought to be a thick red line, today’s news shows it’s possible, for the right company in the right jurisdiction, to offer some sort of compromise on KYC. This news is similar to the one Hugues posted last year. Both Venezuela and Turkey are examples of crypto adaptation when their fiat is hit by inflation. Leading crypto exchange Binance is starting to delist coins that it says don’t live up to the platform’s standards. The first five coins that will be removed from the exchange are CloakCoin (CLOAK), Modum (MOD), SALT (SALT), Substratum (SUB) and Wings (WINGS). On February 22nd, users will no longer be able to trade these coins on Binance but they can continue to withdraw their tokens. Binance says it’s using five criteria to determine which coins to delist. I found some interesting article. Not to difficult to read. Blocpal: Blockchain Payments, Done Right. I haven't investigated it, but on the surface it looks like many other blockchain projects. After saying Bitcoin is dead and has no future JPMorgen now issue it's own cryptocurrency... Since they don't want anything other than profit it means that crypto is here to stay. That is just another approval of crypto which is good. Do I like JPMorgen? NO. They don't do anything good for the society. Does anyone know an App for Android that can monitor which apps access what on our phones? It would be nice to have an overview of which apps access my contacts, how often they do it and if possible how those data are used. Same with photos, microphone etc. 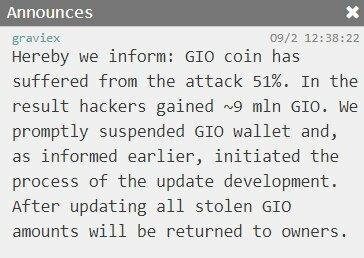 Now it's more common for minor coins to get hacked. I don't have the coin, but if you do trading is suspended.